After decades of retrofitting outdated buildings scattered across several locations to house various departments, the Lake County Commissioners are building a new office space specifically for County operations. 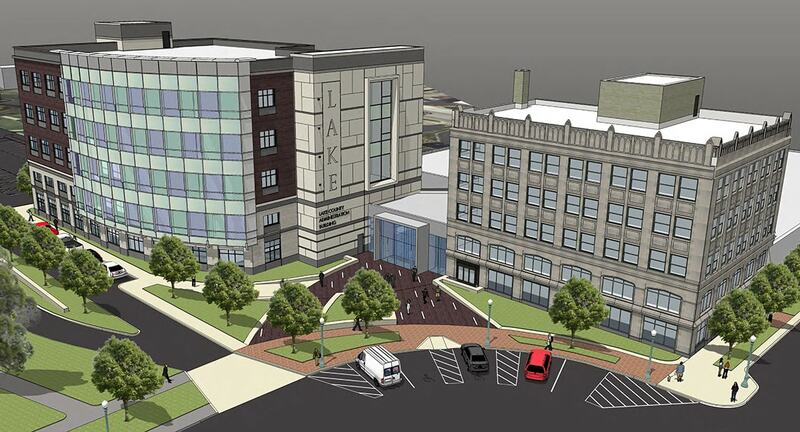 The new Lake County Administration Building will centralize all operations into one cohesive complex that will cover 114,700 square feet – 73,700 of which is new construction. B&N is designing the modern office complex that will stand as a centerpiece on the square in downtown Painesville, Ohio. Joining the old with the new, a five-story building will be constructed adjacent to the existing five-story, 1920s era Nolan Bank Building which will receive a light renovation. A large centralized connector will join the two buildings with a grand lobby space that will welcome visitors. The design will reflect the gothic style of the Nolan Building and a neighboring church, but with modern flair. The new complex, with its inviting lobby, will serve as a new front door for the County from the town square in downtown Painesville. As the design firm, B&N worked with the County to follow a Qualifications-Based Selection (QBS) process to identify a Construction Manager at Risk (CMAR) to hold the construction contract.